2.8 Inch LCD color screen Video Game Console .One of the pictures is the game list. 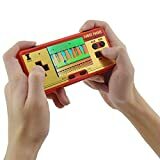 Can take the joysticks become Double player..
Support AV Cable Output,Connect to TV Play Games Together..
Powered by Rechargable Li-polymer Battery,USB Charger..
2.6 inch highlighted LCD Color Display Video Game Console. .
Free Game Card Built-in 508games. Such As:PACMANIA,ROAD RUNNER,BUBBLE. .
Can take the joysticks Double player. .
Support AV Cable Output,Connect to TV Play Games Together. .
High Quality Button,Don't worry When You Play Games Built-in Rechargable Li-polymer Battery . Product size:15.6cm*7.5cm*2.1cm Support TV-OUT function . Color: Red, Dark Red . Built-in 638 different games; with a free game card 130different game. Game 508different games + Game card 130different game Rechargable Li-polymer Battery . Game player,battery, AV cable and charger included . Package: 1 *Game console . 1* Charging 1* AV cable . 1 * Game card .